Welcome to Techno-Billies: From Sheep to Shawl to wrist splints! From Sheep to Shawl to wrist splints! 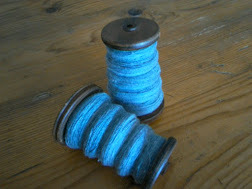 Whenever a new batch of fleece turns up I get really excited to see how it will knit up. 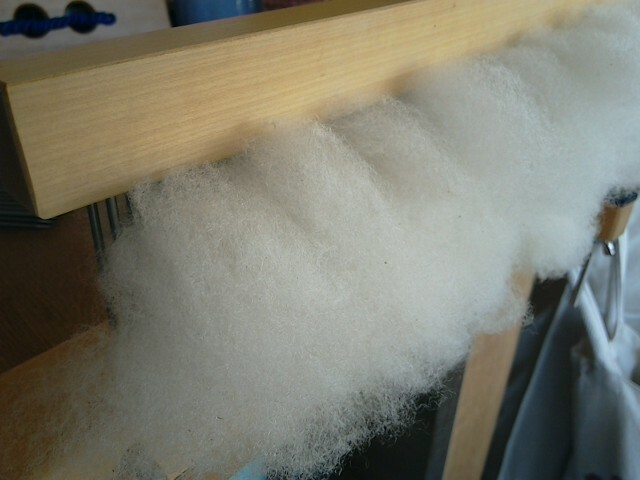 My first ever exploits in preparing a raw fleece for spinning were quite disappointing and I blamed the fleece. Since then I have realised that it's me, not the fleece. Washing, picking, carding or combing are all preparations that at first glance seem easy to do and pretty straightforward to boot. But there are opportunities to ruin a fleece at every stage and it has been, and still is, my goal to get the best out of the local wool. This quest has added hours to the preparation process already and I foresee a few more time consuming changes to be made. 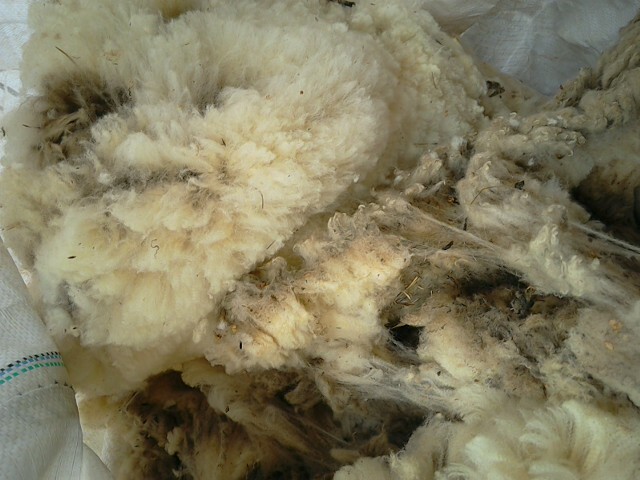 The local sheep are a merino cross, but mostly merino so in theory should produce a next to the skin soft yarn. 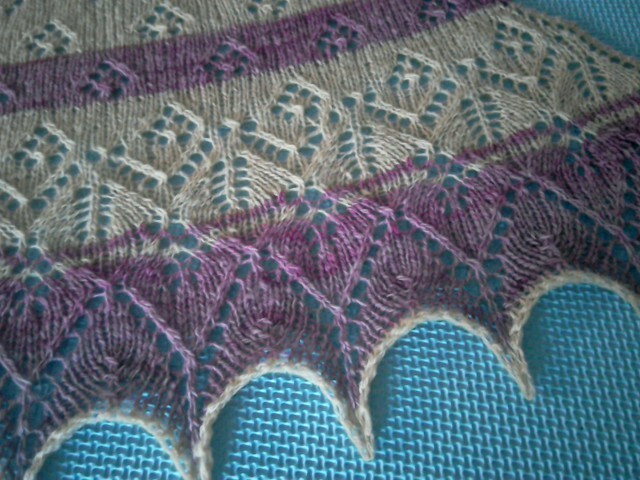 I'm getting there, although this latest project still falls a bit short on the softness side. It certainly is wearable next to my skin but I know others who would disagree. I also made tentative steps into the world of dying. Tea for the main colour and cochineal for the pink - which turned out much more towards mauve than I expected. And then there was the knitting. I learned to knit as a child at my mother's knee, she was a beautiful knitter, and I never managed to achieve her standard of expertise. 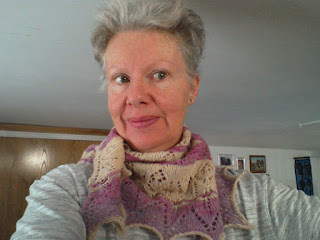 In fact, because of this I abandoned knitting for about 30 years and only since learning to spin have I once again taken up the challenge. And a challenge it was. 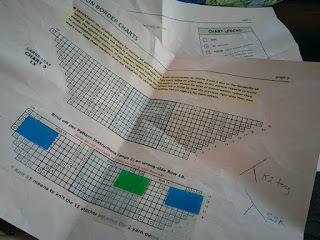 Nowadays they write the patterns differently including charts which are supposed to make it easier. I have great difficulties with following the charts. But in the sincere belief that you can teach an old dog new tricks I stuck at it and I'm pleased I did. This was an easy chart. And even so I made some errors but the eye is kind and tends to perceive a pattern if it is mostly there, filling in the gaps so you don't notice the mistakes. I will do it again at some point. So the upshot of all this endeavour is that I have an rsi injury - both wrists and I am now wearing wrist splints at night in the hope of preventing it progressing to anything that needs surgery. I'm talking carpal tunnel here. Frequent breaks and stretches particularly to the neck and shoulder areas has also helped alot. And is probably a really good idea. I am also trying to think of a name for my Etsy shop. 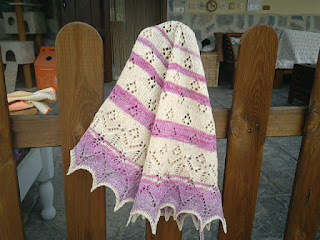 It will be for selling one-off woolly creations like the felted bags or this shawlette and for taking commissions. 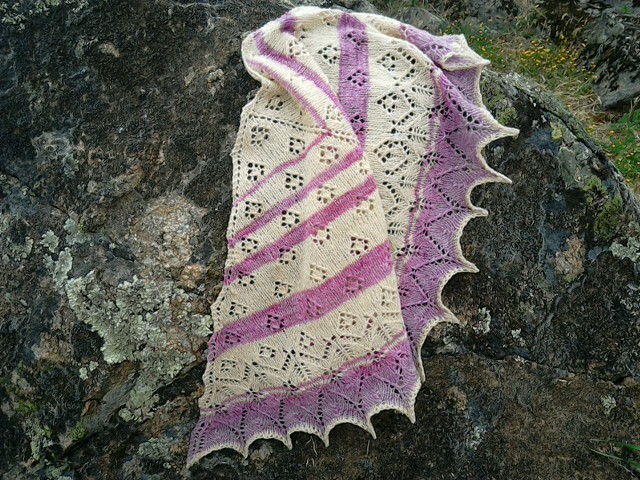 I may sell skeins of wool too. So far the best name I came up with was Extremerino! What dya think? Any other ideas? Your shawl creation is lovely - the colors are soothing without a hint of drabness and the pattern is so delicate. Who could ever believe that the starting material could yield such a beautiful finished product? I like Extremerino! Thank-you Wilma for your kind comments. Extremerino has not found much favour among non fibre people here - perhaps it's a bit more of a technical term rather than a shop name. I'm truly rubbish at this sort of thing so your input is most welcome.